We sent Professional Bowler "Gentleman" Jack Jurek the new "Tournament Special Edition" (TSE) balls to try out and give us his unbiased professional opinion. We were eager to hear what Jack thought of the balls, plus get his insight on how the ball motion would change between balls when only the core is different. 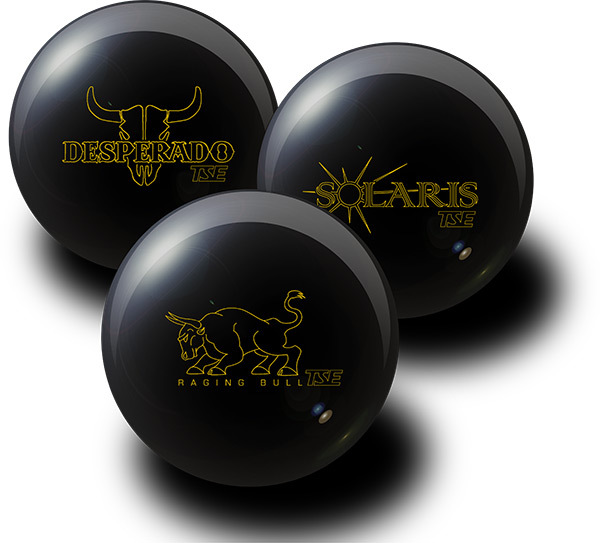 "I finally got a chance to get a few days of throwing the new Seismic TSE balls, the Raging Bull TSE, Desperado TSE and the Solaris TSE. I have to say I was really curious to test these out with the concept of using the same cover on different cores to really see what effect the core has on ball motion. I also got the chance to throw the Solaris Platinum so that also gave me the chance to see the effect the cover has on the motion of a ball. I found the Raging Bull and Solaris to be nice compliments to each other. The Raging Bull seems to read the midlane a little sooner and is a nice strong arc. The Solaris being a strong symmetric gave me just a little more length with a little stronger move on the back end. The Desperado for me being a higher RG and lower Differential definitely held a much tighter line that will be a little more effective for me when the lanes start to break down. I was really impressed by the difference in motion in all 3 balls using the same cover and the same layout in each ball. For me personally and my game, I found the Raging Bull and the Solaris to be a better match for my game. Now for the comparison between the Solaris TSE and the Solaris Platinum. Again I used the same layout in both balls so I got to see the difference that the coverstock makes in a ball. Again for me, I was impressed with the difference in motion in these two balls. The TSE was more hook overall and a little stronger than the Platinum. The Platinum was much cleaner through the front part of the lane. These two balls will make a nice compliment to each other. For those of you out there that aren't afraid to step out and try something new, I would say you will be impressed with Seismic. It looks like I will get the chance to test out a couple other balls from Seismic. I'm looking forward to that and again I will try to post a review for you." We would like to thank Mr Jurek for taking the time to test and review the TSE line for us.